Remember the China of Mao as allied with Khrushchev’s USSR and total paranoid state control of peasants in massive poverty overturned by the Cultural Revolution etc. and so on ad nauseum? Well I don’t recognize it entirely – there are only tiny shadows left. What Osnos presents is NOT my father’s People’s Republic of China. 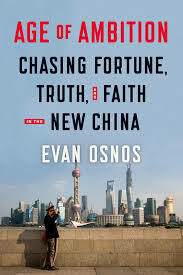 So to limn the topic of “Chasing Fortune, Truth and Faith” Osnos is marvelously well organized. In Part 1, “Fortune,” there is a military deserter, Lin Zhengi, from Taiwan and then the newly rich, entrepreneurs, a gambler and others including an artist. In Part 2, “Truth,” there are journalists, scholars, dissidents, and internet users in general, corruption, (lots and lots of internet use). There are a number of chapters about censorship and the internet. Part 3 deals with Faith and limns the subjects of religion, Mao, true believers. Often the people met in one part, Fortune for instance, are met with again in subsequent chapters. It’s an interesting organization but very well considered and executed.